Rival manufacturers of a delicate disposition should look away now, because the super-slim Philips 42PFL9664H LCD TV is about to deal your self confidence a serious blow. Other companies might be more adventurous and plenty are cheaper, but few seem able to deliver the last word in flatscreen design and specification in a particular price range quite so consistently as Philips. The 42PFL9664H is the Dutch maestro's latest mid to higher-end LCD and comes bristling with state-of-the-art spec, the best examples of audio-visual and multimedia gadgetry currently found on TVs sets and wraps it all up in a frame that makes just about every one of its peers seem plain. This a gorgeously attired telly, with a matt, gunmetal frame trimmed with a faintly Art Deco-ish run of silver across the bottom of the screen and around its outer rim. The bezel, at 25mm deep, is not as radically slender as some of the more expensive, edge-lit LED machines that are currently taking TV aesthetics by storm, but it's still not much chunkier than a cigarette packet and it exudes a build quality that puts just about every other LCD manufacturer to shame. The elegant display, with its subtly rounded edges, sits on a reassuringly sturdy, swivelling base and the whole adds up to the sort of set that is able to add a note of impeccably understated grace to even the swankiest front rooms. It is also comfortably one of the most extravagantly featured we've ever seen. You can take as read that the display resolution is the full 1080p (1,920 x 1,080 pixels), with all those dots being brought to order by the Dutch company's very own, class-leading Perfect Pixel HD engine. This is the very latest in a long and consistently impressive line of image processing circuitry that began years ago with the groundbreaking Pixel Plus. Now optimised for full HD, this awesomely powerful set of picture refinement algorithms is one of the most sophisticated 'engines' ever made. It addresses each pixel individually, ensuring that each is operating to best effect in concert with its immediate neighbours, leading to a sharper, more detailed picture, while extraneous digital dross, such as mosquito noise, is held at bay. This is abetted by the also-proprietary Perfect Natural Motion circuitry. That's designed to eliminate judder by anticipating movement between minute points and correcting any judder it thinks might be thrown up in between, while 200Hz digital scanning is on hand to ensure that the screen is able to keep pace with objects moving swiftly across it, upping the response time of the panel to an impressive claimed 1ms. 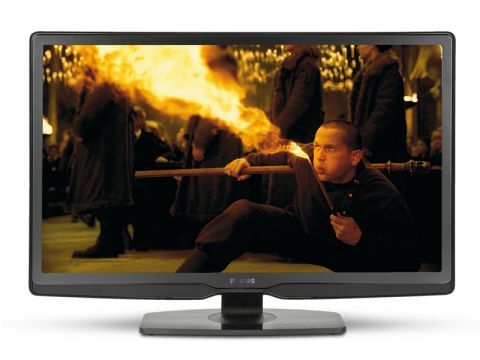 The backlight is of the conventional (cold cathode lamps, as opposed to LED) variety, but is lent an extra dash of high-end gloss with a scanning facility that enables the lamp to flicker in sync with the picture refresh rate, supposedly smoothing movement by an extra degree or two. The final piece of picture-related gadgetry likely to play a part in your buying decision is yet another Philips innovation in the form of Ambilight. Available in several guises throughout Philips' current line-up, the version deployed here is Spectra two, or 'stereo', casting pools of sympathetically coloured light onto the wall behind either edge of the set in harmony with whatever is happening on the screen. Regarded with a degree of scepticism when it first appeared a couple of years ago, the technology's endurance is testament to its genuine usefulness; while we doubt anyone will buy a Philips set simply because of it, we defy anyone not to enjoy the softening, immersive effect that it produces. Moving away from the video side of things, the 42PFL9664 is equipped with one of the better internet systems currently doing the rounds. Net TV enables your set to connect to the web via Ethernet or Wi-Fi and gives you more or less unfettered internet access, as opposed to the handpicked selection of partner sets offered by most rival manufacturers' 'widget' systems. No fewer than five HDMI ports cosy up to all sorts of other useful things including an Ethernet port and an electrical digital audio output for sending the audio to external amplification. One minor oddity is that the secondary connections (the fifth HDMI plus the usual composite video, stereo audio and headphones jack) are labelled on the set and in the accompanying literature as 'Side' connections when they are about as blatantly on the back of the set as it's possible to be. We mention this in order to save you the same ignominy of a fruitless search for a secret, concealed panel containing the auxiliary connections that may or may not have perplexed our reviewer for a couple of minutes or so.